Clinical introduction A 33-year-old man with no history of coronary artery disease presented to the rapid access cardiology clinic with an episode of atypical anginal chest pain. He had a 15 pack-year history of smoking and a family history of myocardial infarction under the age of 55. Physical examination and exercise ECG testing were unremarkable. On assessment in the cardiology clinic, blood sampling was notable for an elevated high-sensitivity troponin I of 61 ng/L (99% upper reference level, 34 ng/L). A coronary CT angiogram was performed (figure 1). CT multiplanar reformatting of the left anterior descending artery with vessel wall analysis of a proximal (blue) and distal (red) segment. Question Which of the following best explains this presentation? The patient was prescribed aspirin and simvastatin. He presented 4 weeks later with an acute thrombotic occlusion of the proximal LAD that required emergency percutaneous coronary intervention (figure 2). 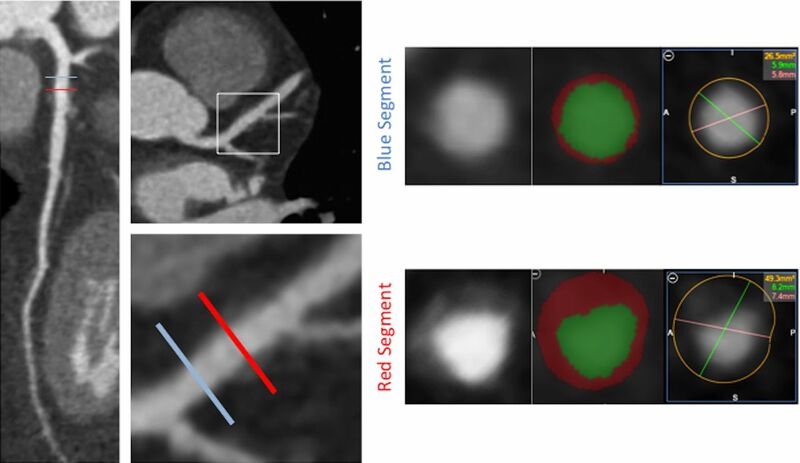 Identifying vulnerable plaques may help target effective treatment in individuals with active atherosclerosis to prevent rapid plaque progression and rupture. (A) Coronary CT angiography of left anterior descending artery (LAD) with non-calcified plaque proximal to first diagonal bifurcation. The arrow points to the culprit plaque in the proximal LAD on the Coronary CT angiogram. (B) Invasive coronary angiogram demonstrated complete occlusion of the proximal LAD. (C) Percutaneous coronary intervention at the site of plaque rupture restored coronary blood flow. Contributors AJM and MRD wrote the manuscript and prepared the images. ADF was involved in the clinical care of the patient.